The Paediatric Radiation Oncology Society (PROS) invites colleagues from around the world to participate in our sixth joint congress with the International Society of Paediatric Oncology (SIOP) scheduled to take place on Thursday 15-18 November 2018. The PROS Educational Day will be held at the International Conference Center of Kyoto, on Thursday 15 November. The PROS /SIOP Congress will be held on Friday 16 November through Monday 19 November at the International Conference Center of Kyoto. The topics for the Thursday Education Day will be Medulloblastoma and Changes in the Approach to Hodgkin Lymphoma. Also on Thursday 21st, a multidisciplinary session with the International Society of Paediatric Surgical Oncology (IPSO) will address Organ Preservation and Fertility. There will be symposia, proffered paper sessions and the D'Angio Lecture. In collaboration with PROS, the SIOP website will allow member registration, online meeting registration and submission of abstracts. We encourage you to visit our website (www.intpros.org) and register quickly as a PROS member. PROS members will benefit from reduced registration fees and access to important sections of the website such as a forum for discussion of critical cases, a directory and the PROS newsletter. This will be the 50th Anniversary for SIOP and the sixth joint congress of PROS together with SIOP. 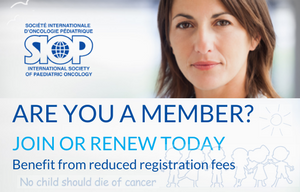 SIOP serves our members well and will encourage other radiation oncologists interested in the treatment of Paediatric cancers to become involved in PROS and to participate in the following SIOP Congress. We are looking forward to seeing you in Kyoto, Japan in November 2018!